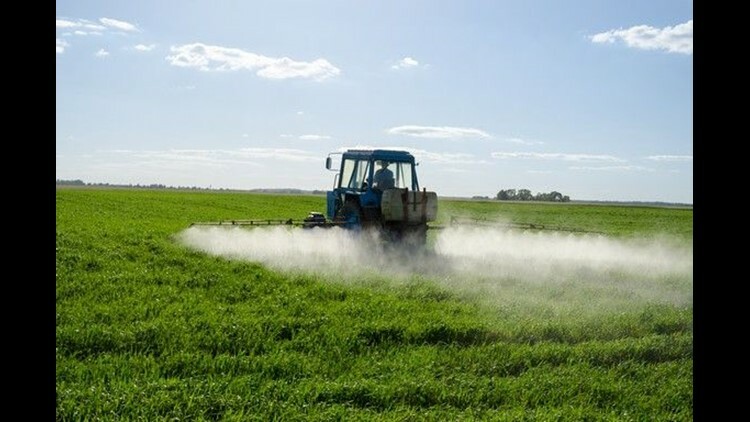 A tractor spraying crops with pesticide. 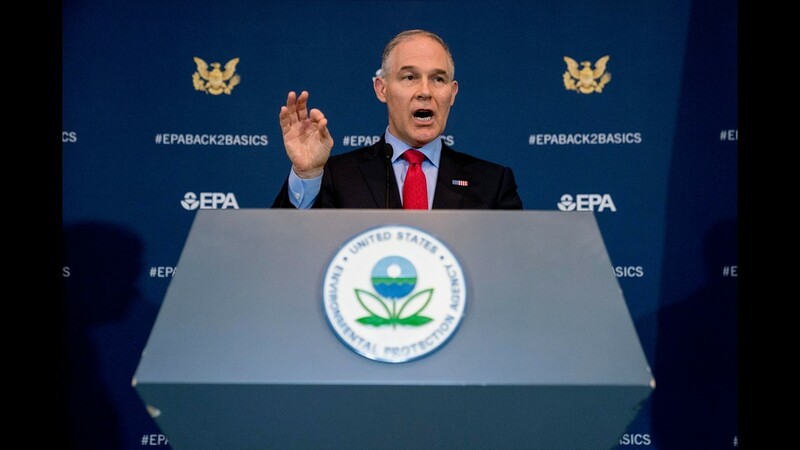 Environmental Protection Agency Administrator Scott Pruitt speaks at a news conference at the Environmental Protection Agency in Washington on April 3, 2018, on his decision to scrap Obama administration fuel standards. 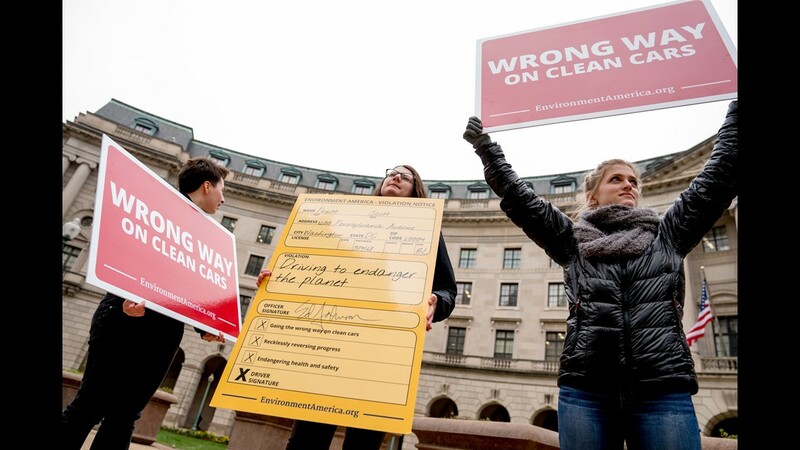 Protesters with Environment America stand outside the Environmental Protection Agency as Environmental Protection Agency Administrator Scott Pruitt holds a news conference on his decision to scrap Obama administration fuel standards, in Washington on April 3, 2018. 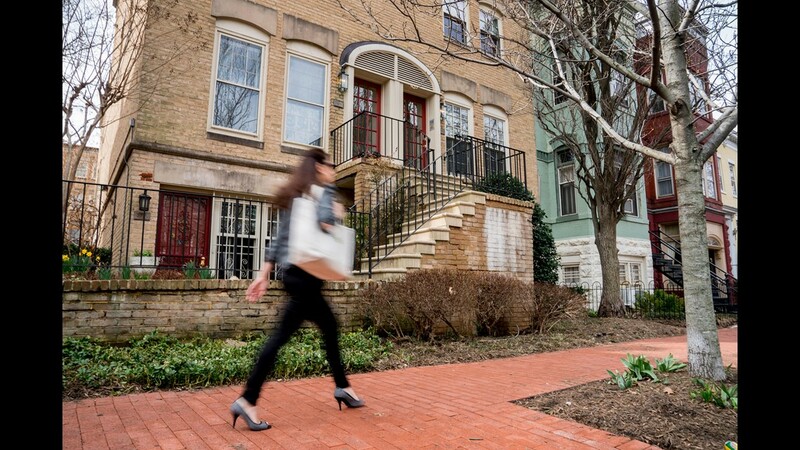 The Capitol Hill condo building where Environmental Protection Agency Administrator Scott Pruitt has stayed in Washington on March 30, 2018. 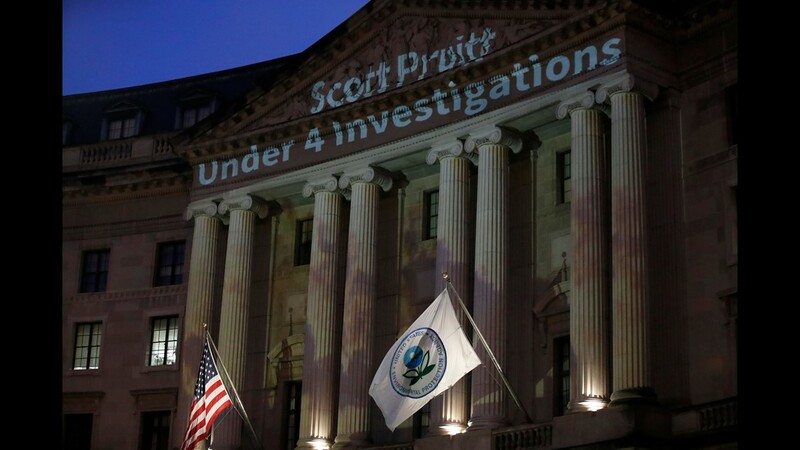 Light is projected by the League of Conservation Voters as part of the new Boot Pruitt campaign onto the Ronald Reagan Building and International Trade Center, the location of the Environmental Protection Agency on March 28, 2018, in Washington. 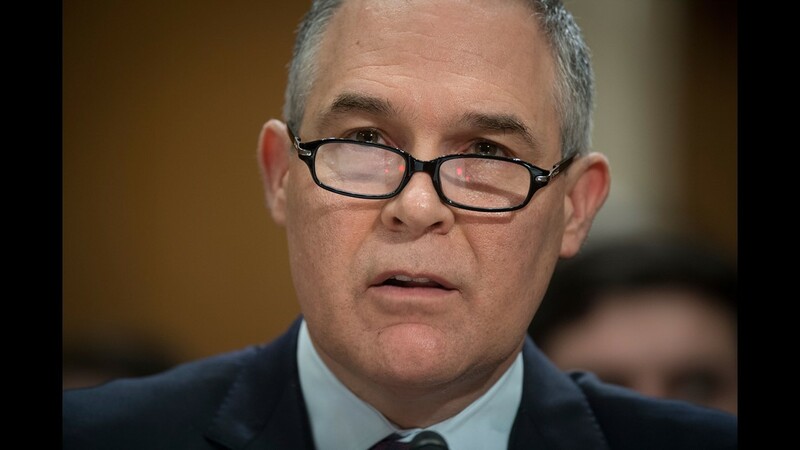 The images describe EPA Administrator Scott Pruitt's wasteful spending on luxury travel, ongoing investigations while in office, and dangerous policies that have imperiled public health. 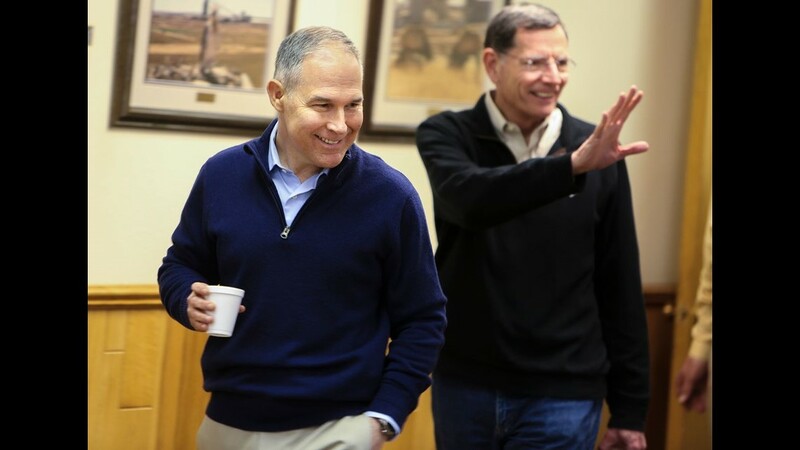 Environmental Protection Agency Administrator Scott Pruitt, left, greets Chairman Sen. John Barrasso, R-Wyo., right, before the start of a hearing before the Senate Environment Committee on Capitol Hill in Washington on Jan. 30, 2018. Also on the committee is Sen. Joni Ernst, R-Iowa, center. 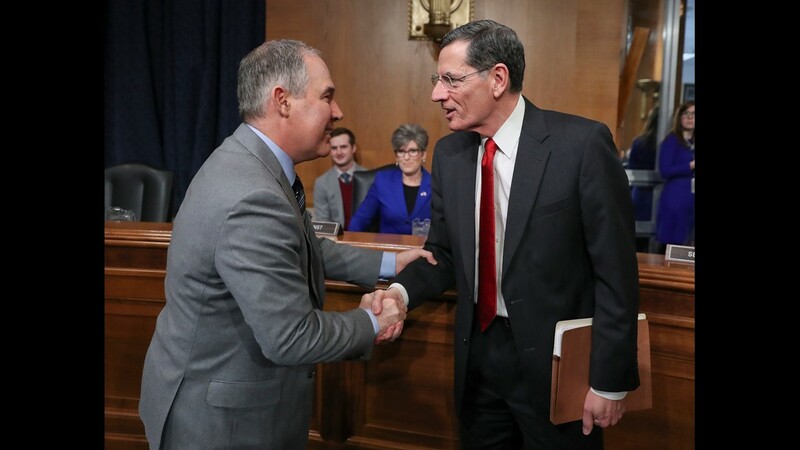 EPA Administrator Scott Pruitt, left, and Sens. John Barrasso and Mike Enzi enter the training room of the Black Thunder coal mine outside of Wright, Wyo., for a press conference with local media on Mar. 29, 2018. 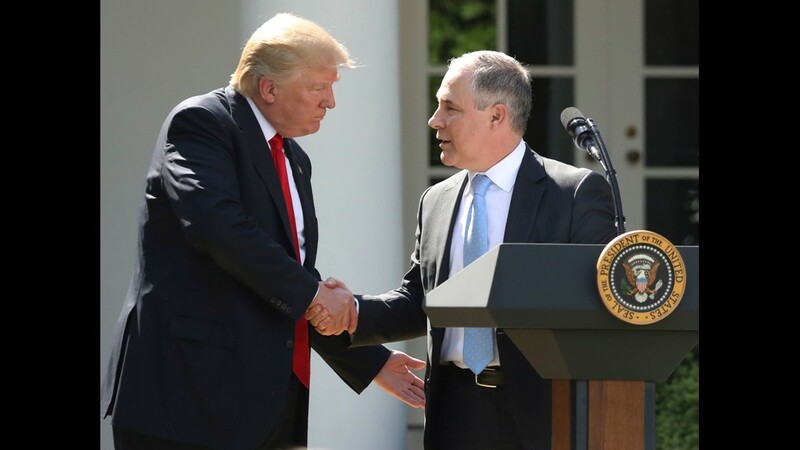 In this June 1, 2017 file photo, President Donald Trump shakes hands with EPA Administrator Scott Pruitt after speaking about the U.S. role in the Paris climate change accord in the Rose Garden of the White House in Washington. Trump and his cabinet often avoid talking about the science of climate change, but when pressed what they have said clashes with established mainstream science, data and peer-reviewed studies and reports. 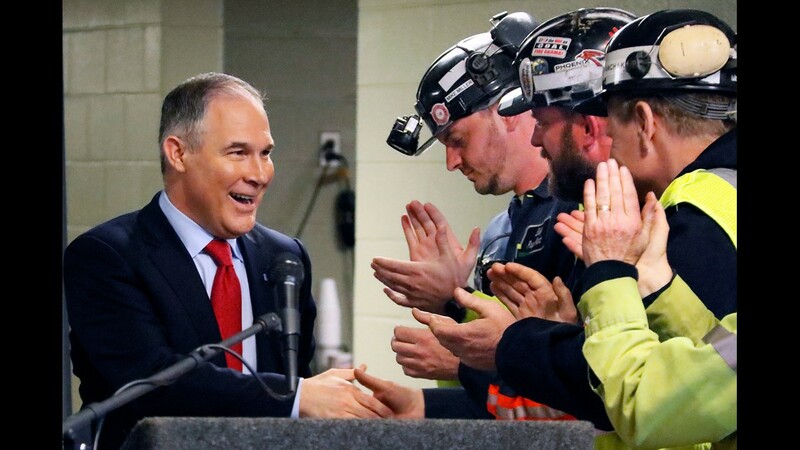 U.S. Environmental Protection Agency Administrator Scott Pruitt, left, shakes hands with coal miners during a visit to Consol Pennsylvania Coal Company's Harvey Mine in Sycamore, Pa. on April 13, 2017. 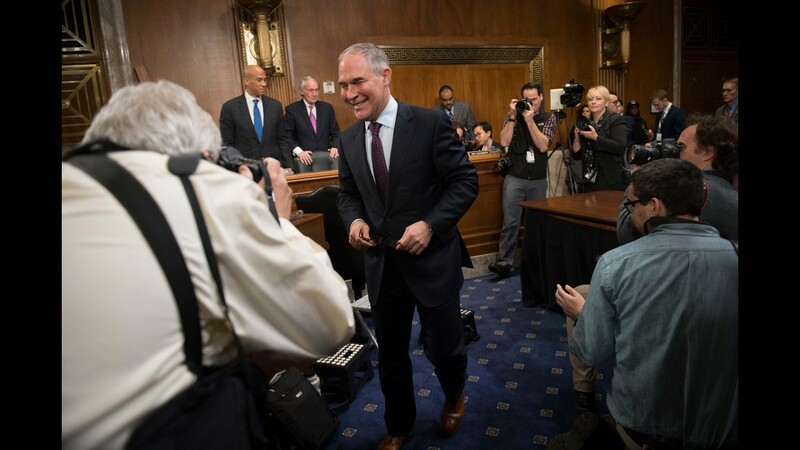 Scott Pruitt, nominee for Administrator of the EPA, during confirmation hearing before the Senate Environment and Public Works Committee on Jan. 18, 2017 in Washington. 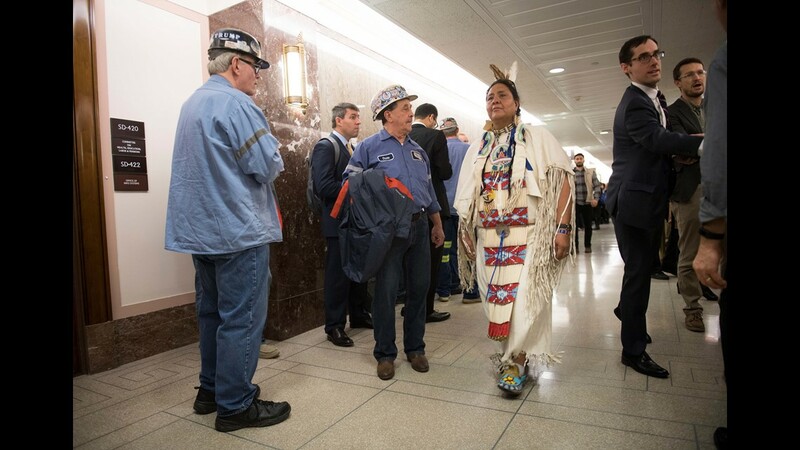 Joann Spotted Bear from Wounded Knee, South Dakota and coal miners from Ohio and West Virginia arrives with large crowds before the Scott Pruitt, nominee for Administrator of the EPA, during confirmation hearing before the Senate Environment and Public Works Committee on Jan 18, 2017 in Washington. 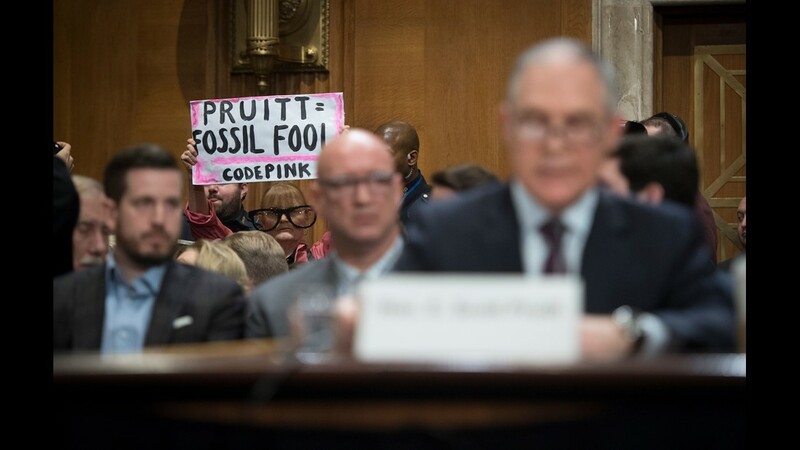 Scott Pruitt, nominee for Administrator of the EPA, during confirmation hearing before the Senate Environment and Public Works Committee on Jan 18, 2017 in Washington. 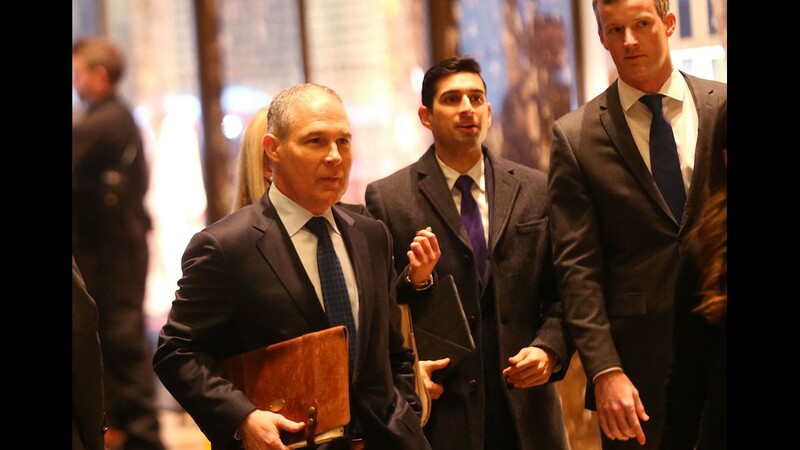 Oklahoma Attorney General Scott Pruitt arrives at Trump Tower on December 7, 2016 in New York City. Potential members of President-elect Donald Trump's cabinet have been meeting with him and his transition team of the last few weeks. 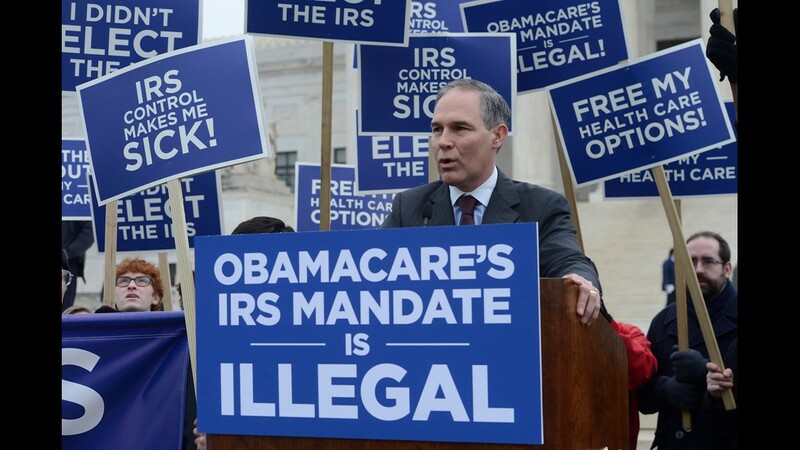 Oklahoma attorney general Scott Pruitt speaks to opponents of the Affordable Care Act outside of the Supreme Court on March 4, 2015. The U.S. Supreme Court heard oral arguments on King vs. Burwell. The King vs. Burwell case will decide whether the language of the Patient Protection and Affordable Care Act allows consumers to receive premium subsidies in states that have not established their own exchanges and instead are relying on HealthCare.gov.